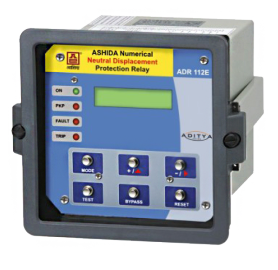 The ADR132A is member of Ashida Numerical Relay family (Aditya Series) design to meet demand of low and medium switchgear control. ASHIDA is one of leading voltage protection relay manufacturer in India. The ADR132A is basically 3 phase Under/Over voltage protection with definite time. The ADR132A continuously monitors all 3 phase voltage, through PT connections. The high-speed micro-controller samples this voltage sine wave through a 12 bit A/D converter. The microcontroller performs powerful Digital Algorithms to find out Amplitude of voltage signal, and then this value is use for protection and metering function.